1. If there’s no law, it’s not a country, it’s a failed state – the recent wave of killings of anyone perceived to be ‘anti-regime’ in Ukraine, accompanied by not only resounding failure to investigate, but actually official endorsement of those responsible – the fact that the police in Ukraine defer to terrorist group Pravy Sektor. Just the start of a long list. There’s no law whatsoever in post-Euromaidan Ukraine. 2. If there’s no democracy, it’s not a country. It’s a banana state. On February 22nd, 2014, Euromaidan kicked out not only a democratically-elected president, but a democratically-elected government. It waited three months before holding elections for a new president, 8 months before parliamentary. By that time, all too late, the extremist element had already taken a stake way beyond electoral control – neo-Nazi party Svoboda, despite scoring less than 5% in the parliamentary elections, still vocally sit in Ukraine’s parliament, regularly send fighters to the front. 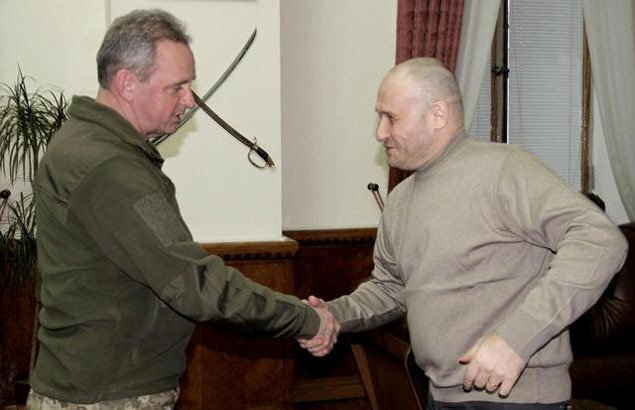 Leader of neo-Nazi terrorist group Pravy Sektor Dmitry Yarosh (pictured), who polled less than 1% in the presidential election, on Interpol’s wanted list, is now an official aide to to the Ukrainian military. 3. There will never be peace in Ukraine. There’s now a history, and future, of violent revolution. Maidan set the precedent, installed its president in Ukraine by violent revolution. Yet Maidan was comprised of different factions, far from all of whom support the president. 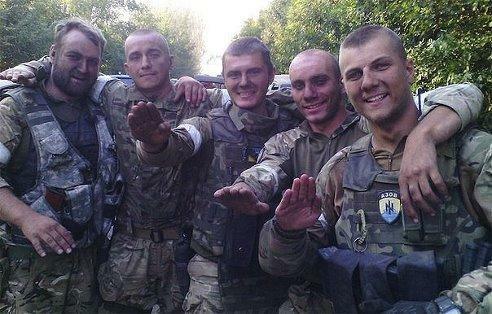 In fact Ukrainian neo-Nazi Azov Battalion (pictured) have frequently stated their intention for a ‘new Maidan’ and a desire to ‘bring the fight from Donbass to Kiev‘. Even the generally pro-Kiev Moscow Times has written of the likelihood of another Maidan. Maidan set the terms for the institutionalised demolition of democracy in Ukraine – a couple of thousand extremists, and a mass easily gulled by patriotic slogans, in central Kiev can, violently, topple any government they want. Ukraine’s president Poroshenko knows it, does everything he can to appease the radicals. Every objective person knows that whatever, there will never be peace in post-Euromaidan Ukraine. 4. Crimea, once the golden territory of the land, held a referendum to vote out of Ukraine, will never return to Ukraine, even Germany’s leader Angela Merkel admitted that with her recent statement of ‘we won’t forget it‘ (but we won’t do anything about it). Once a country loses a part of its territory, it’s never the same country. 5. The Donetsk and Lugansk People’s Republics, are never returning. Ukrainian forces haven’t taken any territory there since July of 2014, they’ve only lost territory. DPR and LPR forces have consolidated lines, and if there is movement, it will only be to take more of Donbass – currently they have around 1/3 of the region which once produced 80% of all Ukraine’s coal, but from which the DPR and LPR do not supply to Ukraine any more, whileindustrial production in the rest of former industrial heartland Donbasshas mostly ground to a halt. 6. Normal life is almost impossible in Ukraine. Inflation in Ukraine is at 272%, the hryvnia’s worth at less than 40% of what it was. 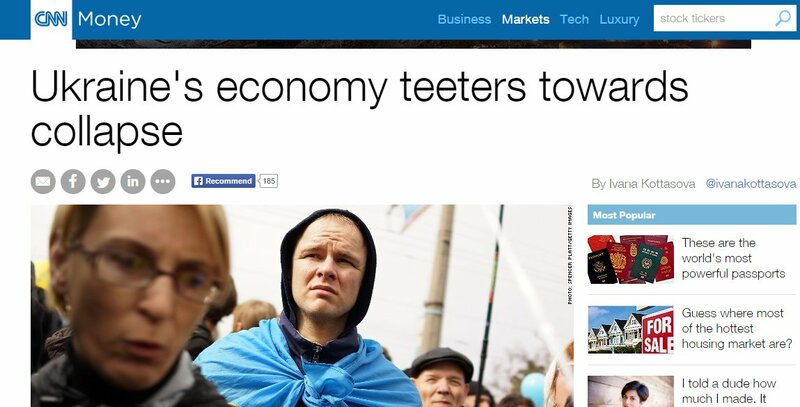 Inflation has rocketed, salaries have collapsed,businesses across Ukraine have closed. 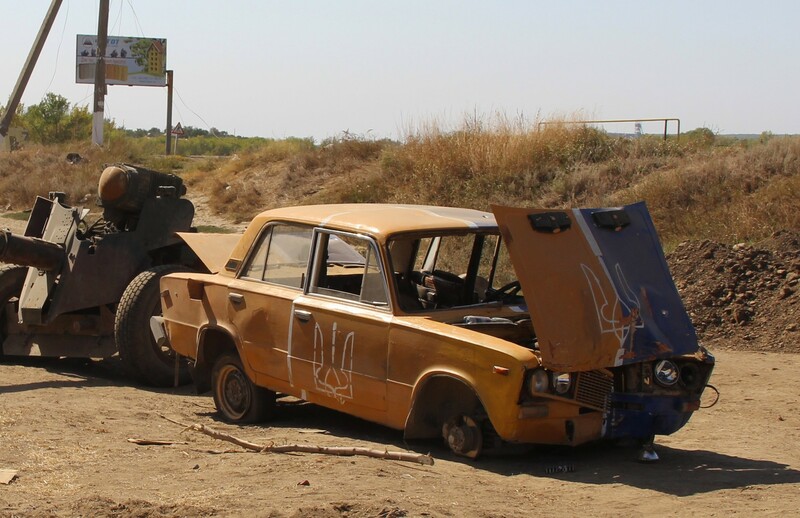 In short, people don’t have any money in Ukraine anymore – sales of new cars down 67% year-on-year – production of cars down 96%, 46 banks declared insolvent in the last year. As for the eternal thorn in Ukraine’s side, corruption, one which apparently became so pressing one of the defining aims of Maidan was to extricate it – it’s even worse than it was before. And for Ukrainian soldiers killed in action in Donbass, sources were estimating that at over 20,000 last August. 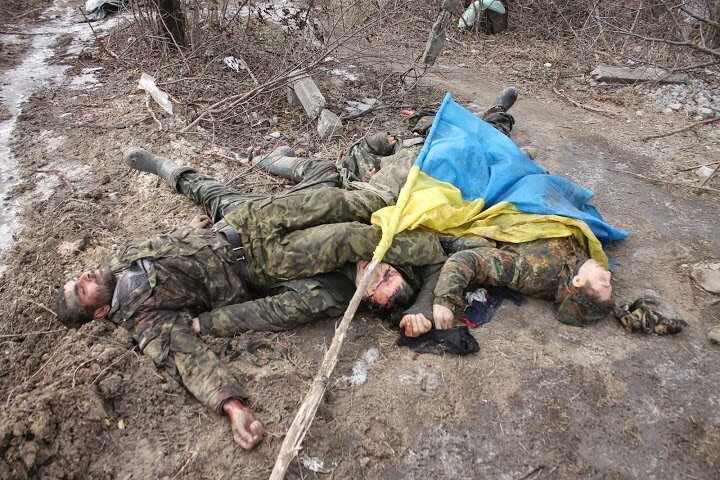 I’ve seen the bodies of dozens of Ukrainian soldiers, how many of those were identified, fewer than a quarter. Across Ukraine – extreme poverty, hyper-inflation, unemployment, and relatives who left, or were mobilised, to fight in Donbass, disappeared forever, whose fate will never be known. There’s no normal in Ukraine anymore. 7. Ukraine’s debt is over $80 billion – set to hit $100 billion soon, 100% and rising of a sinking GDP. An agreed recent IMF bailout programme of $17,5 billion would only scratch the surface. Ukraine’s economy shrunk 7.5%, by conservative estimates, in 2014. Estimates for this year range from 6% to over 20%. European governments pledge support, meanwhile European businesses withdraw on mass, hundreds have already left the Ukrainian market, most of the 600 German firms operating in Ukraine conducting an audit about withdrawing from the market. Trade with the country which was Ukraine’s leading export and import parter by far, Russia, understandably decimated, Ukraine’s economy is stricken, and only going down. 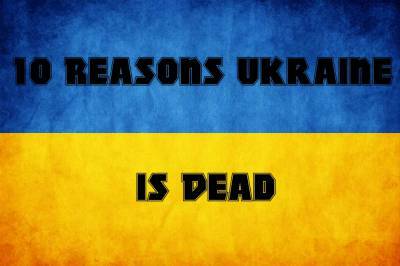 Ukraine now is associated with blood, death, war. There’s blood associated with the Ukrainian flag from its military shootings in Odessa to Mariupol, to its military relentlessly shelling civilian areas of Donbass. The perception, identity, the very definition of ‘Ukraine’ has changed forever. 9. There’s no one who could make Ukraine one again. There’s no political figure who can unite the former country. No one elected or placed in Kiev could ever win the support of those regions which have broken away, by the very fact of their being connected to Kiev. No political figure would ever be elected in those seceded regions on a ‘united Ukraine’ platform. There’s simply no one who can make Ukraine one again. 10. There will be a ‘Ukraine’, whatever that is, in future. But the ‘Ukraine’, to some simply ‘the Ukraine’ is finished. It’s dead. The sooner those pro-Ukraine accept that, the more lives will be saved, the quicker they can find what, where, ‘Ukraine’ is, after all, and start to build that, rather than destroy the former Ukraine.